LASUS today offers a standardised wall thickness measuring system for all the forming stages in the hot production of tubes. The measuring principle is the proven ultrasonic technology which has now been further developed for use even at high temperatures by means of laser induction and detection. The measuring system and results from the practical application in seamless tube production are presented. LASUS supplies wall thickness measurement values with high local resolution and can be used even where a tool (mandrel bar) is used inside the tube. The variety of potential applications for the system and the excellent quality of the measurement data open up a new level of quality for seamless tube production. Early control of the rolling process is of great importance in the hot production of seamless steel tubes. Wall thickness values measured on the hot tube can be used for optimisation and for open or closed-loop control of the individual rolling units. Of course, wall thickness measurements also contribute considerably to quality control and to improving the quality of the tubes. Because of the high tube rolling temperatures of approx. 800°C to over 1000°C, contactless measuring is generally necessary; for service life reasons, even a considerable distance should be maintained between the measuring head and the tube. Gamma-ray testing is the well-known and established procedure for hot measurements, however, with the disadvantage that invariably two opposite wall areas are radiographically examined together in order to determine a mean wall thickness. 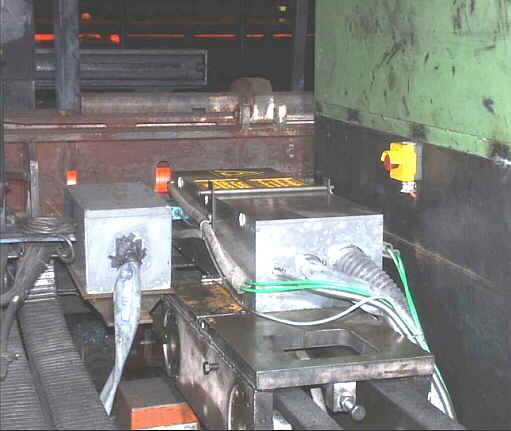 While an internal tool (bar) is present, as in certain parts of the rolling line, gamma-ray testing cannot be used at all. Measurements with laser-induced ultrasound provide a solution that meets all of the above requirements. This technology uses the proven method of ultrasonic measurement of the echo time, with the wall thickness being calculated from the time the ultrasound needs to pass through the tube wall and the sound velocity of the tube material. The pulses of ultrasonic energy are induced and detected visually, without any contact with the tube: A short, high-energy laser pulse (pulse duration < 10 ns) is absorbed by a small measuring spot on the tube surface, where it causes a slight material ablation (within a range of nanometres of the wall thickness), which in turn causes a pulse of ultrasonic energy to enter the tube wall perpendicularly to the tube surface since the pulse is maintained. This pulse of ultrasonic energy is reflected by the inside surface of the tube and causes a slight deflection of the entry surface in the measuring spot after passing the wall, which is detected by a continuous-wave laser of a stable frequency by means of the Doppler effect. An interferometer converts the occurring change of frequency into a change of intensity. A measuring signal of this kind, a time sequence of ultrasonic echoes, can be reprocessed and evaluated analogously to a measurement according to a conventional ultrasonic method. The wall thickness measuring system designed to be used for automatic operation of a rolling mill consists essentially of commercially available laser and optical components and of an evaluation and control system developed by us. Its technical features include robustness, compactness and modularity in view of the intended use in a tube rolling mill. Figure 1 shows the schematic structure of the measuring system in the one-channel version as well as the essential data of the system components. The measuring head represented in the upper part of the illustration, which can be positioned at the distance of 160 mm to be maintained from the tube surface, accommodates both lasers, a flashlamp-pumped Nd:YAG pulsed laser with a wavelength of 1064 nm for ultrasonic excitation and a diode-pumped, double-frequency Nd:YAG continuous-wave laser with 532 nm for detection. The wanted signal backscattered by the tube is reproduced within the measuring head on the entry of an optical fibre which forms the connection to the Fabry-Pérot interferometer located in the mechanically and thermally safe environment of a measuring cabin. This measuring cabin also holds the central control system with the interferometer stabilisation system and ultrasound electronics. The latter is based on the MESUS electronics (of the MFI) for conventional ultrasonics technology, which has already been used in tube rolling mills many times. The so-called local electronics, installed close to the measuring head, essentially consists of a supply unit for the pulsed laser. The measuring rate of the present system is fixed at 50 Hz due to the flashlamp-pumped Nd:YAG pulsed laser. This results in excitation pulse energies of approx. 250 mJ. Systems with higher pulse energies are available as an alternative, however, currently only with reduced measuring rates of 10 or 20 Hz. Figure 2 shows the prototype version of the one-channel measuring head on the right, installed in the run-out section of the stretch-reducing mill of the mandrel mill of V & M in Mülheim/Ruhr. The passing hot tube, transported longitudinally from the left to the right, can be seen in the background. The LASUS measuring system including all its components as well as the central control system and evaluation unit of the measuring system is represented in Figure 3. The equipment cabinet with the monitor and operating elements is shown in the upper left-hand corner, the LASUS unit with the measuring head, adjustment mechanism and supply unit on the right. The Fabry-Pérot interferometer, which is installed in the vicinity of the control cabinet, is not shown. Fig 3: Central control system and LASUS measuring instrument. The measuring system was installed in the place behind the stretch-reducing mill shown above for over a year. Whenever a tube passed in longitudinal position, a wall thickness profile was taken across the tube length. A typical example of such a longitudinal section is shown in Figure 4. A total of approx. 3350 tubes were measured in hot condition. Figure 5 shows the diameter and wall thickness ranges covered at a glance. Fig 4: Tube profile measured in the rolling mill. Fig 5: Dimensional range of tubes measured. The present system was used to measure wall thicknesses of up to approx. 25 mm, based on the tube rolling schedule; it should be easy to increase this figure by approx. 20%, according to the experiences made. In addition, exciter lasers with higher pulse energies would need to be used, as already mentioned above. However, in view of the modular system concept, this should not present any major problem. To check the wall thickness values measured in hot condition, comparison measurements in the form of conventional manual piezoelectric measurements were carried out on individual tubes after they had cooled down. Figure 6 shows such a comparison. Fig 6: Longitudinal tube profile: Comparison of piezoelectric/laser ultrasonic measurements. Taking into account that it nearly is impossible to hit exactly the same measuring track and, furthermore, that the temperature-dependent sound velocity was not precisely known, this can be considered a fairly close correspondence. To enable an additional comparison between laser ultrasonic measure-ments and piezoelectric ultrasonic measurements without the influence of temperature, the circumference of a sample tube was measured in the laboratory at room temperature, as represented in Fig. 7. Fig 7: Circumferential profile of a tube: Comparison of piezoelectric/laser ultrasonic measurements. Precisely the profiles measured in Fig. 6 and 7 raise the question of accuracy in ultrasonic wall thickness measurements. Because of the basic type of measurement, measuring inaccuracy is due partly to the echo time and partly to the sound velocity, both with laser-induced and piezoelectrically induced ultrasound; i.e., the measuring inaccuracies of both process variants are basically comparable. However, in the case of the hot measurement the temperature dependence of the sound velocity also has an effect, and therefore knowledge of the tube temperature and the corresponding sound velocity is absolutely essential. In the evaluation system the current tube temperature is considered. A value of 0.1 mm can be entered as a reference value for the measuring inaccuracy. The automatic measuring operation in the rolling mill is controlled via a number of operating contacts, for instance, synchronisation with the tube passage. In addition, data records containing settings and results can be exchanged with a higher-level computer system via an optional coupling. Fig 8: LASUS integrated into process optimisation in the hot production of seamless tubes. Since LASUS can be used universally in the hot finishing line of seamless tube production, the precondition for improving quality control and process optimisation in these production lines considerably has now been created. For this purpose, LASUS is connected to the to the CARTAÒ / Technology Systems of SMS Meer for open/closed-loop control of the different rolling mills and/or rolling processes. Fig. 8 provides an overview of the quality acquisition and process control stations in the hot finishing line of a pipe mill. The figure shows one-channel and multichannel designs of the LASUS equipment. Basically, either a swivelling one-channel system or a multichannel system can be used for every station. It is obvious that LASUS makes it possible to acquire measuring data down to the smallest detail even directly downline of the rotary piercing mill and the elongator, with a tool in the workpiece, and downline of the stretch-reducing mill, where a resolution of the cross-sectional contour by means of gamma-ray testing methods is not possible due to the small tube diameter. An effective tool for process and quality control is available in the form of the laser-ultrasound wall thickness measuring system that has been presented. It can be used economically primarily in the hot section, even with products of other geometries. In addition, it may be expedient to employ it for complex, hardly accessible surfaces. An extension to several channels is possible due to the relatively compact form of the measuring head. When these channels are arranged e.g. around the circumference of the unit under measurement, a two-dimensional longitudinal and circumferential wall thickness profile can be measured, given an adequate number of measuring tracks. 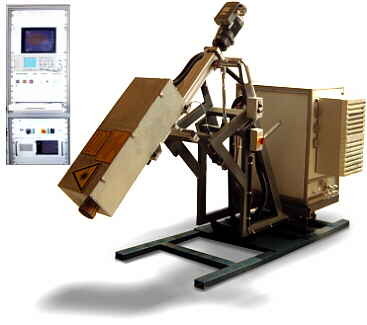 The application potential will still increase as a result of parallel further development of the system components, particularly the laser components. These developments focus on the rate of repetition, pulse energy and even greater robustness of the system. 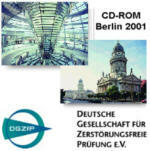 G. J. Deppe, F. Hüls, M. Sauerland and H. Schneider: Laser-Ultraschall-Wanddickenmessung an heißen Rohren in einem Walzwerk, Paper presented at DGZfP-Conference, Berlin, Germany, 2001.